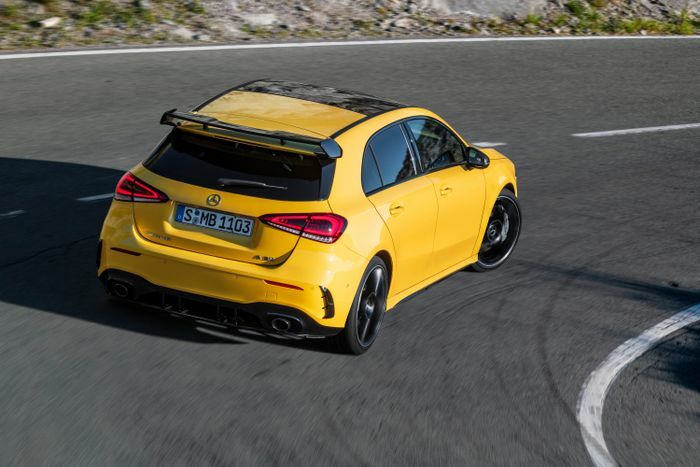 Before you panic, don’t worry: the next AMG A45 is still happening. 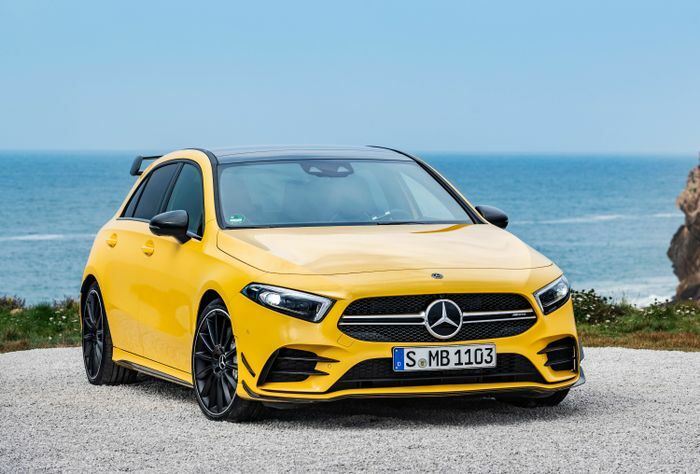 It’s just Mercedes is no longer content with having a pop at only the Audi RS3: it wants something to give the S3 a headache too. 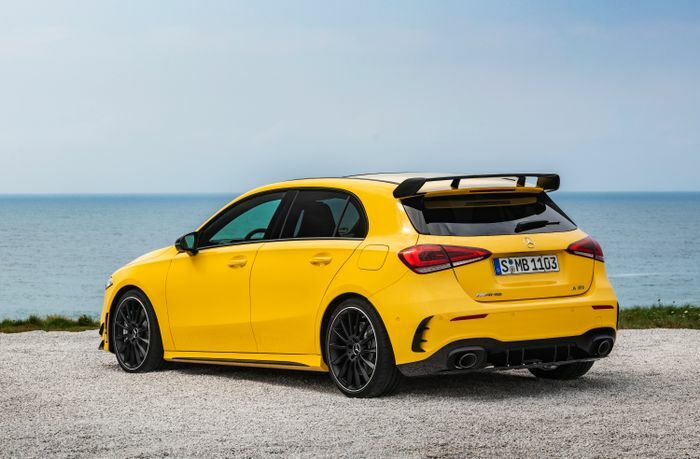 Plus the VW Golf R.
So there’ll soon be two hot, AMG A-Classes. 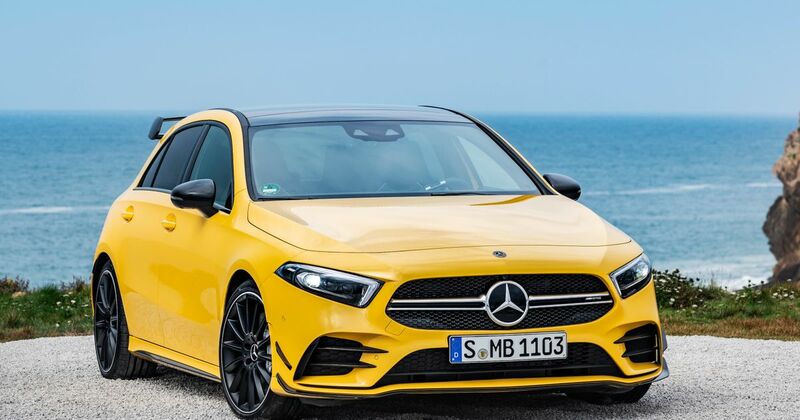 The yet-to-be-revealed A45 with a circa-400bhp output, and this, the new A35, which is effectively the new entry-point for the AMG range as a whole. It uses a development of the new 2.0-litre inline-four turbo engine found in the A250, here making 302bhp at 6100rpm, and 295lb ft of torque at 3000rpm. 0-62mph takes just 4.7 seconds, which sounds pretty damn good for what’s supposed to be the junior hot hatch in the range. Top speed meanwhile is the entirely expected 155mph electronically-limited affair. Power is sent to all four wheels via a seven-speed dual-clutch gearbox (you weren’t expecting a manual option, were you? ), with an electro-mechanical multi-plate clutch controlling the split between the axles. When you’re just pootling along torque will be sent to the front wheels exclusively, with the system able to send ever-more thrust rearwards as driving conditions demand, up to a 50:50 split. Mercedes-AMG has added various bracing measures to stiffen the body-in-white, with the aim of improving stability and turn-in sharpness. Suspension-wise, you’ll find a four-link setup at the back, while at the front there are MacPherson struts with a geometry bespoke to the A35. The aluminium wishbones are new, and various bits and pieces like the wheel carriers have been lifted from the A45. Should you wish to spruce up the chassis further, adaptive dampers will be available optionally. Stopping power is taken care of via 350mm discs at the front squeezed by four-piston monoblock calipers, and rearwards you’ll find 330mm rotors and single-piston sliding calipers. The silver-painted calipers also have AMG logos, which has to be worth at least 5bhp. The car will be shown in public for the first time at the Paris Motor Show in October, with sales kicking off later that month. The first UK cars will be landing during the first quarter of 2019.